It is for me, both an honour and a pleasant duty to speak on behalf of His Excellency Alassane Ouattara, President of the Republic, on the occasion of the solemn opening ceremony of the Consultative Group for the mobilization of the required funding to the implementation of the 2016-2020 National Development Plan (NDP). I would like to express my warmest thanks to all participants in this important Advisory Group, including the entire international community. Your large and distinguished presence translates once more, your continued commitment alongside Ivory Coast, in its efforts to build an emerging economy, generating high economic growth, sustainable, inclusive and equitably shared. I would particularly like to thank the Chairman from the World Bank Group of the, Mr. Jim Yong Kim for accepting, again, that his institution brings its invaluable support and guidance for the preparation and organization of this meeting in its Paris premises. Finally, I wish to reiterate my gratitude to France for its support and renewed commitment to Ivory Coast. This support is reflected in the financing of major direct impact development programs in favour of the Ivorian population in general and in particular by the accompanying provisions of these meetings. This Consultative Group current meetings, gives me the opportunity to reflect on the actions undertaken by the Government, over the last five, under the authority of the President of the Republic, His Excellency Alassane Ouattara, to provide effective answers to important challenges that followed the post-election crisis that weakened the state and shook the foundations of our social cohesion. - Ensure economic recovery and national reconstruction. Concerning peace and security, despite the recent terrorist attack in Grand-Bassam, in March, a rapidly subdued attack; it is easy to say that today the Ivory Coast is characterized by peace, domestic security and the found stability. Indeed, the country has managed to significantly reduce the impact of a decade of crisis as confirmed by the declining evolution of the national index of insecurity, which stood at 1, 11 at the end of 2015 against 3, 8 in 2011 and the one of the United Nations which went from 4 to 2, the same in Geneva and New York. Regarding national reconciliation and social cohesion, they remain priorities for which substantial progress has been made. Proof are notably, the successful presidential elections of 2015 and the acceptance of the result by all candidates. The handover by the soldiers of illegally occupied private properties and the start of the process to compensate victims of previous crisis of the previous crisis have significantly helped. In terms of economic recovery and national reconstruction, numerous structural and sectoral reforms implemented have ensured the stability of the macroeconomic framework during 2011-2015. Indeed, the average annual growth rate was 9%. - and the strong increase in investment. The budget deficit represented 2.2% of the GDP in 2013 and 2014 and contained to 2.9% in 2015, when the debt ratio remained sustainable at 41.3% of the GDP at end 2015, when the WAEMU standard is set at 70% of the GDP. The inflation rate is also contained at 1.2% in 2015, below the WAEMU community standard of 3%. 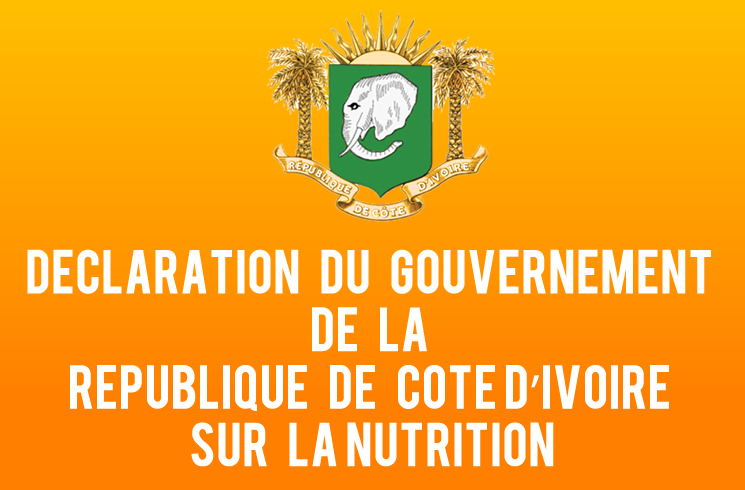 With the 2012-2015 NDP, Côte d'Ivoire has also fostered public and private investment. The global investment rate has doubled over the 2011-2015 period, from 9% of GDP in 2011 to 20% in 2015. Public investment respectively rose from 3.4% in 2010 to 8% of the GDP in 2015 while private investment went from 8.9% of the GDP to 10.7% over the same period. These investments led to a marked improvement of the population access to essential new economic infrastructure, basic social services such as healthcare, education, housing, drinking water and electricity. - Ranked the 8th most competitive economy in Africa according to the latest report of the World Economic Forum published with the World Bank, the ADB and the UNDP. These reforms have also helped to record a significant increase in the average monthly income per active person, in all sectors, going from 40,000 FCFA CFAF in 2008 to 84,000 in February 2015, an increase of + 110% compared to 2008. The poverty rate went from 51% in 2011 to 46.3% in 2015. Representing about one million people out of poverty. Indeed, pro-poor expenditures rose from 1 080, 3 CFAF in 2012 to 1 337 billion FCFA in 2013, 1521 billion CFAF in 2014 to 1716 billion CFA francs in 2015, a 59% increase over the 2012-2015 period. We all share these results with all the Technical and Financial Partners (TFP) whose support and multidimensional assistances have had a catalytic effect on our efforts, partners to whom we reiterate our sincere thanks. Today, Ivorian Government main commitment, is to work for the structural transformation of our country and the emergence of a new Ivorian. 5) and the emergence of a new Ivorian. - Strengthening the statistical system to make it more efficient in order to have real time reliable data, for the design of public policies and decision making. - Improve access to finance for businesses and individuals. - Improve the nutritional status of the population. - Continuing and strengthening the development of income generating activities for women, while paying particular attention to the fight against violence against them. - ambition and optimism as a motivator to give the best of oneself, to make Côte d'Ivoire a country that matters and wins. It is the very existence of these challenges, many more to overcome, that gives a meaning and justifies not only the government action, but also the required and sustained support of the all development partner community. It is still the existence of these challenges, sometimes complex, that makes the Consultative group meetings important and essential. This meeting is presented as an open and constructive dialogue framework between Côte d’Ivoire and all its public and private partners, around its imperatives and development priorities. To this end, I can assure you that the Government has traced the trajectory of its development by integrating a prospective, planned and programmatic approach through suitable instruments that are «Côte d’Ivoire 2040 National Prospective Study", the 2016-2020 National Development Plan and the 2016- 2018Public Investment Program (PIP). I would add that Côte d’Ivoire has benefited from the assistance of the OECD Development Centre to develop its strategic plan for the emergence in 2020 and whose main recommendations for reform were incorporated in the 2016-2020 NDP. This plan also takes into account the environmental protection requirements held by the Paris Agreement on climate. A roadmap for its implementation has just been adopted by the Government. Similarly, we are particularly pressing to initiate, starting now, the needed reforms to enable the optimal implementation of the Sustainable Development Goals (SDGs). It is worth mentioning that the Government which aim to ensure to the entire population an optimal nutritional status has adopted the 2016-2020 Multisectoral National Nutrition Plan. This plan worth 267 billion CFAF or 470 million USD is an integral part of the 2016-2020 ND, as one of the key areas of human development. - Projects from private investment: 18,700 billion CFAF, or 37.4 billion US dollars and 62%. The ambition and the will of the Government, under the high auspices of the President of the Republic, His Excellency Alassane Ouattara, for the next five years, is to maintain macroeconomic stability, to achieve the diversification and structural transformation of the economy and to accelerate structural and sectoral reforms to maintain the economic growth rate at a high level at around 9% over the reference period. It is also about containing the inflation, ensuring the sound public finances and the sustainability of the public debt. On this last point, I would like to reassure all our partners on the fact that Côte d'Ivoire pays special attention to its debt policy. To this end, it should be noted that at the end of 2015, the ratio of the public debt to GDP is contained at a level of 41.3% against a WAEMU community standard of 70%. As we can see, there are financing margins that the Government intends to use to meet its development requirements, in strict compliance with the principle of viability and sustainability of public debt. The implementation of our development plan requires the commitment and support of all stakeholders and the mobilization of substantial public and private financial resources, from endogenous and international sources, at all available counters, including the occasional ones. In view of the Plan budgetary framework, the need for public funding is estimated for the 2017-2020period at 4425 billion CFA francs (8.8 billion US dollars), or 39% of the public investment. -amplify the efforts made since the 2012 Consultative Group to strengthen the coordination, the monitoring and the evaluation portfolio of the development partners while strengthening its cooperation with all its partners. The contributions of your respective institutions to the implementation of the 2016-2020 NDP will translate your support for the construction of a strong and emerging Ivorian nation that His Excellency Mr. Alassane Ouattara, President of the Republic, has promised to build. I cannot end my speech without ensuring that the Government will take all necessary steps to ensure the efficient management of resources made available to Côte d’Ivoire. I believe in your commitment to support Côte d'Ivoire in its tracks of economic, social, environmental and cultural development. I assure you in return, of the strong Government determination to make every effort, like during the 2012-2015 period, to meet all the challenges that will mark our evolution towards a better future for our valiant people. For the future of Côte d'Ivoire and of the West African sub-region as a whole, I wish us, during the different sessions, a fruitful work, constructive and honest exchanges, as part of a win-win partnership at all levels. It is on this note that I declare open, on behalf of His Excellency Alassane Ouattara, President of the Republic, the Consultative Group meeting for the financing the 2016-2020 National Plan for the Development of the Côte d’Ivoire.